It had been only a year since the death of Francois Cevert and the retirement of Jackie Stewart and yet the new generation of drivers had made that seem like ancient history. The World Championship had been a four-way battle between the Ferraris of Niki Lauda and Clay Regazzoni, the McLaren of Emerson Fittipaldi and the Tyrrell of Jody Scheckter but there had been seven different winners. The World Championship had boiled down to three men: Fittipaldi with 53 points, Regazzoni with 52 and Scheckter, the outsider with 45. In pre-race testing Regazzoni had a huge accident and bruised his leg and Ferrari had to fly a new chassis out from Italy. Scheckter too needed a new car having demolished his at the Canadian GP. The only changes in the driver lineup were that Jose Dolhem had been brought back at Surtees after Derek Bell's failure to qualify in Canada, Eppie Wietzes did not reappear in a the Brabham he had raced in Mosport and Tim Schenken was being given a run in one of the troublesome Lotus 76s, while regular drivers Ronnie Peterson and Jacky Ickx concentrated on the ancient 72s. Practice began with another big accident which left Jean-Pierre Beltoise with a cracked bone in his foot after he demolished one of the recalcitrant BRMs. He played no further part in the activities. Pole position was taken by Carlos Reutemann (Brabham) with an impressive James Hunt taking second position in his Hesketh. Also impressive was third-placed Mario Andretti in the new Parnelli while Carlos Pace underlined Brabham's challenge with the fourth fastest time. Then came Lauda, Scheckter, John Watson (Hexagon Brabham) and Fittipaldi with his championship rival Regazzoni right behind him. The top 10 was completed by Jean-Pierre Jarier in his Shadow while behind them Jacques Laffite did a good job in the Iso-Marlboro to qualify 11th. More impressive was Chris Amon's 12th place in the only BRM. Further back Denny Hulme was starting his last Grand Prix from 17th on the grid and Peterson was a depressed 19th. At the start Reutemann led Hunt into the first corner while Andretti's hopes ended with electrical troubles. This left pace third ahead of Lauda, Scheckter and Fittipaldi. Regazzoni was next but the Ferrari was handling terribly and in the laps that followed the Swiss driver dropped slowly back behind Watson and Arturo Merzario (Iso-Marlboro). All Fittipaldi had to do was to keep an eye on Scheckter. On the tenth lap Helmut Koinigg crashed his Brabham head-on into the barriers. The car split the rails and the Austrian was killed instantly. Surtees withdrew Dolhem from the race when the news reached the pits. But the race went on and at the front Reutemann still leading Hunt and Pace. Then came Scheckter and Fittipaldi. Regazzoni went into the pits to change tires but rejoined and found his Ferrari to be no better. He would continue to run for the rest of the afternoon but his World Championship hopes were over. 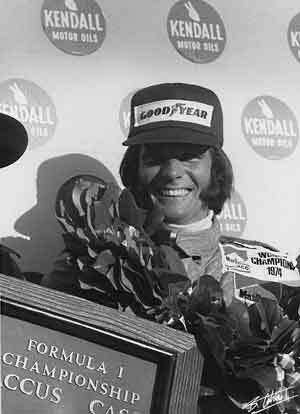 Even if Fittipaldi retired he was unlikely to win the title. In the mid-race Lauda began to suffer from handling trouble and dropped behind Scheckter, Fittipaldi and Merzario. He retired on lap 39. Hunt was in trouble in the closing laps and Pace closed up and took second place with four laps to go to give Brabham a 1-2. Hunt finished third while Fittipaldi's World Championship was secured when Scheckter retired on lap 45 with a fuel leak, leaving the McLaren driver to collect three points. Merzario also disappeared and so Watson took fifth and Patrick Depailler (Tyrrell) sixth.